Our product range includes a wide range of metoclopramide hydrochloride, paclitaxel and temozolomide. 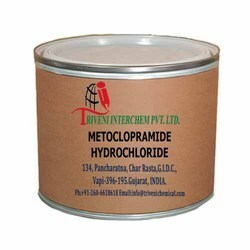 Metoclopramide Hydrochloride (7232-21-5) is solid. it is also known as Metoclopramide Hcl. it is use in Chemotherapy, Gastroparesis and Abdominal Fullness Industry. Storage: Keep container tightly closed. Keep container in a cool, well-ventilated area. Paclitaxel (33069-62-4) is powder white. it is use in chemotherapy and anticancer Industry. Storage: Keep container tightly closed. Keep container in a cool, well-ventilated area. Temozolomide (85622-93-1) is solid white light brown. It is use in Oncology API and Pharmaceuticals Industry. It is a chemical compound. Temozolomide (85622-93-1) is solid white light brown. it is use in Oncology API and Pharmaceuticals Industry. Storage: Keep container tightly closed. Keep container in a cool, well-ventilated area. Looking for Chemotherapy API ?